Friday construction post - Why can I never get these done on a Friday? It was all going swimmingly. That alone should have clued me in that something was looming overhead. Last Monday came with the resolve that we'd make the plunge and get really started on the kitchen renovation. It should have happened sooner, but it takes a bit of committment to completely redo a kitchen in a house you are living in, in the Arctic, in the winter. You are going to be without a place to cook your meals, all that stuff needs to find a place to sit in a house that is already far too crammed with things. But nothing else could proceed until it was done. It was time to take a week off work and buckle down. Monday was mostly taken up with the ripping apart of the old kitchen. The top cupboards came down and will be reused. The base cupboards, with their glued on countertop and glued to the floor construction, didn't fare that well. The old (well not that old really) stove was given away, and the fridge moved out of the way until the new one could go into place. Then we lifted the tiling. I never want to look under tiles again. When I originally planned the renovation, I had planned on just laying the underlay ply directly over the old tiles. Then I discovered that the vinyl tiling had not been glued down properly and could easily be lifted out by hand, so plans changed. Now you have to realize is that up here most country food gets eaten on the floor. Cardboard is layed out and the seal, fish, caribou or what ever is cut up and consumed while everyone sits around on the floor. Its not hard to see how that came about, iglu and qarmaq don't have tables. Its not a bad thing. But over the years some blood gets spilled and mopped up and apparently that works its way underneath poorly glued down tiling. Where it percolates. So a clean up and eventual painting over of the subfloor put a minor delay in plans. Nothing major though. Next step was the laying of the underlay. Very simple process, with no hiccups. The underlay gets cut to length, a light bead of adhesive and then I get to go crazy with the stapler. More firing than any "First person shooter" game yet designed. The only bit of a challenge was where a fridge which had been leaking from the self defrost thingy over the years had rotted some of the floor below. The old underlay in that area was simply cut out, lifted and replaced before the next layer of underlay went over top. I expected more grief with the cupboards quite frankly. I had little faith that the walls would be square, or plumb. They weren't, but neither were they as bad as I had expected. And the cabinet system made it fairly easy to deal with. The upper cabinets are hung on a rail, essentially you measure up a distance from the floor at both ends of the walls and snap a line to mark the top of the cabinets. Snap another line 2.5 inches below that and mount the rail. The cabinets bolt to the rail and you can adjust them up or down, and side to side. The two flies in that ointment was a rise in the floor along the exterior wall, throwing out my line. That coupled with a corner out of square made it challenging to fit the upper cabinets in well. The other thing was more of an aggravation than any thing else. Not one stud on that far wall in the photo above was spaced equally. Not even close. Centres ranged from 24 to 11 inches, with no two values the same. How in the hell do you build a wall like that? But I suppose that is what stud finders are for. And to make a long story shorter, by Friday Leah and I had put together the cabinets, installed the main bank of them, and the counter top for it. The kitchen now looked like this. Then we unwrapped the counter for the penisula. Yes that counter is 10 inches shorter than the cabinets. With the arrival of our sealift this week work is going to begin in earnest starting tomorrow. I thought I'd lay out where I'm heading in this renovation. The first priority is the kitchen, but I can't head off all willynilly, as some things have to be accomplished with forethought to what comes next. The plans also took a very big hit this week, but more on that a little later. In general terms we are replacing our cupboards, adding new appliances and putting in new flooring, but as often is the case there is a lot of adjustment that has to be made to get to those goals. First of all the cupboards. Our living room/dining room/kitchen is one open space, "L" shaped with the kitchen at the foot of the "L". Right now the cupboards go along one wall, with a little jog along a second. In order to separate the kitchen from the rest of the space, we decided to extend the cupboards along the third wall, and then out into a peninsula that will act as a divider between the kitchen/dining room. Problem number one arises with a window on the wall of the extension. It is low enough that the backsplash of the cupboards will cover it up. The solution was to get in a window, that was shorter and replace the original window. Problem number three. With both a new counter and the range located on an exterior wall new electrical would have to be added. On an exterior wall this means messing with the vapour barrier and insulation, both of which I was loath to do. So the solution was to build out a false wall to run the electrical. The room loses two inches but it makes things that much easier. As it turned out, the electrician discovered that the wall was already strapped out two inches, so this didn't need to be done, but by that time the cupboards were already bought and designed to fit, so the wall would have to be built anyway. Which leads to the practical planning on how to proceed with the kitchen. So this is how I intend it to unfold. First of all the old window gets removed. The framing gets built in to accommodate the new window, and with that comes insulation, vapour barrier, tyvek, siding and trim. Then the new window can get installed (it is very cleverly packed between the two new exterior doors I ordered, well protected but now I have to empty that crate to get at it). After its installed the new wall can be framed, gyprocked and mudded and taped. It will probably need a coat of primer for protection, even though most of it will be hidden by cupboards and backsplash. After that the rest of the cupboards and old appliances will be removed. From this point on, we no longer have our kitchen for use. The walls need to be clean up and prepped. The new underlay can go down at this point. Except the top of our crate had been crushed in and water got into our stuff. Judging by the mould on some of the cartons it had been wet for awhile. Water and the pressboard material that they make cabinets out of do not mix. Well, actually they mix all too well. Several of our cabinets are ruined by swollen wood and in some cases mouldy swollen wood. That throws everything out, as you can't build a half of a kitchen cabinet system. So now we are in the process of making the claim through the shipping company, buying replacement cabinets and getting them air freighted up here. I can't imagine what that will cost. Friday construction post - now on any day of the week. We're in the house. Well, "in the house" is overstating it, we've taken possession of it, a couple of days late, but no mind. And true to buying well used homes, there's more work there than we thought. Much of our work can't get going until sealift when we've got a ton of supplies coming in. But there is a lot of work that will be easier to get out of the way before we move in. Such as painting part of the house. I won't go into a lot of detail right now, but its a heck of a lot of money to pay for a fixer upper. The biggest surprise is the toilet doesn't work. We planned on replacing it regardless and have one coming up on sealift, but that's almost 2 months away. 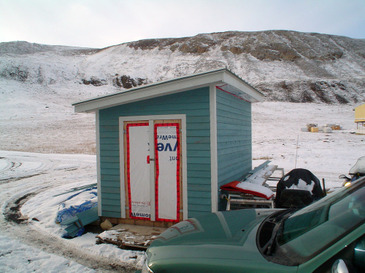 Many houses up here use a marine style toilet, as opposed to one with a reservoir. The chief consideration is water use. This one, however, doesn't use any water, and um the washroom needs attention. So we're faced with getting a toilet here, to tide us over until our dual flush arrives. The other big item we're not prepared for is even more of an expense. We need to replace all of our bedroom (five) windows. Some have only one pane of glass and some have broken mechanisms. The ones that are down to single panes have been sweating water because of the lack of insulation, and now the drywall below them needs replacing, who knows about the insulation under that. Again, we'd planned on replacing the windows, down the road. I'm not a fan of vinyl windows, certainly not esthetically, and certainly not for this climate. But we'll probably have to make due with these somehow for another 14 months. The windows we'd like are expensive and I doubt if there's enough time to make the sea lift anyway. We'll probably we walling them off temporarily. But right now its painting and prep work. We filled about 8,003 nail holes in livingroom/dining room/kitchen, got them sanded and the walls and ceiling washed. Leah has done an incredible job putting two coats of primer in the living room. I've been madly pulling off all the baseboard and such, and I've had the front door knob and/or deadbolt off at least four times today. The previous owners had no key so we've had no way to lock up at night. But, as I discovered, the exterior doors on this house have five inch throws for some strange reason. I've finally got a locking knob that'll fit the existing throw, so she's all locked up. But after the initial "what the hell have we gotten into" and depression that came with it has faded away. It feels good to be back at construction/destruction and now that those layers of fresh paint are up, the place looks full of possibilities. Tomorrow the plumber/o.b.m. and the electrician will be there. We'll have a serviced furnace, a new(ish) toilet, and new plugs for the kitchen and stove installed. And some sconces. The former owners left us with one light bulb. Its not even worth the fight. We took a drive out to the new airport today and its good to see the work on the airport terminal coming along. Perhaps by the end of the summer flights will be coming into Arctic Bay instead of a half an hour away at the airport that was built in a cloud. The plane on the apron belongs to the construction company. Essentially, until the airport gets taken over by the government it is a private strip operated by the company, and they can use it as such. The runway and lights etc. have been completed, and I believe that they are waiting on the completion of the terminal and the approval of Nav Canada before opening it officially. Like spring, it is slowly coming. This is a photoblog right? So, a while back, Teepe's Weblog and Way Way Up tagged me with a meme. I don't know why but memes have lost their lustre to me. Way back, I was frustrated at not being tagged and practically begged someone to tag me. In fact I may have just tagged myself, this is so sad. But I digress. Here then are the rules that govern this 6th photo meme. The original rules said open your Documents folder, but that's not where my photos are held, and my sixth folder contains other people's photos, so I decided to skip that and go to the seventh folder in Pictures. I should have picked the fifth. This folder contains the photo records of some damaged doors. Back when we were building the House everything, of course, arrived in crates. Despite our tarping most of the crates that had to sit for any length of time, the crate containing our interior doors and bi-fold doors for closets leaked. Causing water damage to every door. Several of the bi-folds were beyond saving, while most of the interior ones suffered some sort of water staining at the minimum. The amount of damage is difficult to quantify. Its not so much the physical damage as the cost in time and delays because all of the doors had to be cleaned, sealed and painted. The time spent doing that added to the time it takes to complete construction. Partially as the result of this only four closets have any doors on them, the one at the client entrance, both doors on the laundry chute, and the laundry space under the stairs. In the case of the space under the stairs those doors were ordered later and came on our second sealift. I won't tag anyone. If you feel like playing along and haven't yet been tagged have at her. Saves begging someone. ... pictures of the House in winter. Here is the (almost) complete Gas Box from the last Friday Construction Post. On Saturday I sided most of the box, but it was a slow process, or slower than it should have been. Because the box doesn't have consistent dimensions each siding board had to be individually measured, and then the end cuts painted. Temperature was around 1 above so even the super amazing stain that Cape Cod Siding supplies took a little while to dry. So it was almost a one board at a time affair. I got a little smarter after doing the one side and worked on the two remaining sides at the same time, but still it was slow going for the size of the project. Thursday evening saw me haul out the table saw to rip down the last remaining three boards and the front piece of trim. While I was waiting for those to dry I built Travis a rough little wooden skidoo to pull around (they are everywhere up here). It's an Alpine as it has one ski. All that remains to do on the Gas Box is paint the doors and the end cuts of the trim when it is nicer and put in a small shelf for oil and naptha bottles. Today I finally got to a project that I had been ignoring for too long, a gas box for the House. You see up here we tend to keep a jerry can or eight kicking around for the snowmobiles and ATV's, with sufficient jerry cans that if we do want to go for a trip out on the land they are there. I've probably bought twenty-five jerry cans since I've been up here. They have a habit of being borrowed and never returning. Locking them up won't prevent that from happening, but it is a good idea anyway. It is safer, discourages theft, and although it isn't a big problem up here solvent abuse does occur and this just makes it a little harder. Considerations were that it would have to be lockable, able to hold at least six jerry cans, solid, weatherproof, and fit in with the house. Oh, and cheap. Thinking ahead, I kept one of the crates that held construction materials for this very purpose. But apparently I didn't think too far ahead. One thing I learned very early on in my construction instruction was that square, straight, plumb and true are good things. This crate is none of the above. Starting the project I quickly found that the bottom of the crate is a full inch wider than the top, and this crate is only about a metre tall. I sat there an pondered how I was going to fix this dreadful unsquaredness and eventually I came to the conclusion "this is a box for holding jerry cans for crumbs sakes, live with it!" Living with it meant that making things like doors would be a little more difficult, but nothing was impossible. Living with my construction sensei's dictum "Always think plan ahead" the first thing I did was add extra 2X4's in the corners to have something to nail the siding to at the end of the project. Yes, siding. Remember it must look like it belongs with the house, besides I've got a good pile of siding left over. Hmm, another discovery, none of the four corners are the same height. Not major differences, but my god what did they thing they were making... a crate? Oh, yeah. It has been a long time since I had one of these posts. I've gotten the construction bug of late and have been siding the shed as a means of satisfying it. 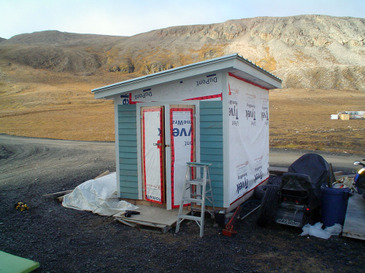 I started to work on the project some time ago by putting Tyvek on the outside of the shed. 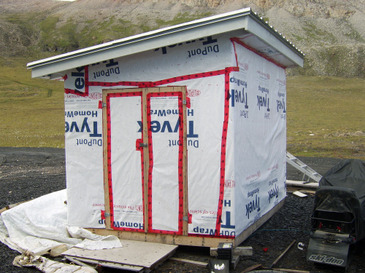 Tyvek is a windproof paper that will both seal the shed from the wind and protect the wood from any moisture that builds up underneath the siding. Unfortunately, putting the Tyvek on coincided with some wet miserable weather, so this was as far as the project got for awhile. However, after awhile nice weather returned and the project moved forward in dribs and drabs since then. I've found that having two small children to look after, and the B&B is not conducive to getting a lot done. Most of the siding has been done while Hilary naps, or Leah is home for lunch. The trim that I put on was left over window trim from the house, as we didn't trim out the windows, feeling that they looked better with out them. When we originally built the shed there was no thought on putting siding on it, so the next step was to attach lumber inside to provide the nails something to grab on to. This was needed around the doors and in the corners of the non-gable walls. Normally the walls should be strapped out with 1 by material, and the siding nailed into this. This provides a space for moisture to move down and not collect underneath the siding. However I decided to attach the siding directly to the walls because 1) I had no 1 by material left and 2) well, its a shed. 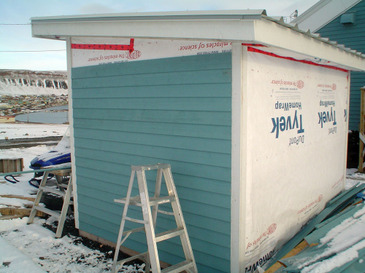 Then it was simply a matter of cutting the siding to length, painting the cuts and attaching the siding directly to the wall. The ends cuts are painted to protect the lumber but in this case it is more a matter of asthetics. Because the window trim material is thin (5/8") the edge of the siding sticks past the trim. If the ends weren't painted it would look stripy and unfinished. It is pretty straight forward, the only trickier spots are under the eaves of the gable ends where the siding has to be cut at an angle to fit. I'm now about 3/4s of the way done, and if a little nice weather comes I should be able to finish in a day or two. I'm not sure how I'm going to finish the doors, or the soffets but that will probably wait until next year anyway. Those of you who live where the mercury doesn't regularily hang out in the minus 20's and below, probably never get to experience the joy of a frozen sewer vent, something that happens up here several times over the course of the winter. Sewer systems usually have a vent up on the roof, letting all of the noxious gases escape out of the house, rather than in the washroom or elsewhere. Of course these gases are nice and warm and moist, and when they hit cold winter air they freeze, usually building up over time and eventually capping off the vent. That means that the sewer gas (and remember in our case it is a nice warm sewer tank below the house that is generating the gas) has no where to go and soon the house smells like, well, like a sewer tank. Normally the solution is to get out a ladder and crawl up on to the roof with a kettle of boiling water and/or something to chip away the ice and open up the vent that way. But our roof is way too dangerous for that method. The sewer vent is probably about 35 feet up, and the roof is slippery metal, pitched at almost 30 degrees (28.41 degrees to be a little more precise). Our solution is quite elegant actually, (and when I say "our" I mean I nodded enthusiastically when Gary and Dale thought about it). First of all the roof where the vent is located is uninsulated around the pipe. This allows heat from the house to warm the vent stack and keep ice from forming in it. This is only a partial solution as the gas still freezes when it meets the cold air and the ice forms outside the vent, still building up and blocking. The second part of the solution was to bring the stack straight down into a clean out and branching the stack off from there. This clean out is in the attic. So when the vent freezes over, as it did again today for about the fifth time this winter, I simply go up into attic and take the cap off the clean out (holding a bucket underneath to collect the condensed, er, water). I then use a long stick to punch out the ice from below, opening the vent once more. The technique still needs some refinement, I need to come up with a better "chisel", as frequently I just punch a small hole in the ice, which quickly freezes up again, but all in all it sure beats climbing up onto that roof in -35 degree weather, hoping I'd hit a snowbank on the way down.